Why not eat in and take advantage of our pitcher and pizza offer? 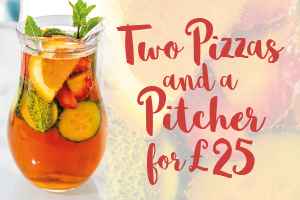 Don’t miss our fantastic pitcher and pizza offer – your choice of two pizza’s from the menu* plus a pitcher of pimms, strawberry fizz, tequila, beer or cider, all for £25. Our handcrafted pizzas are made using the finest ingredients, locally sourced where possible and cooked in our traditional clay oven.